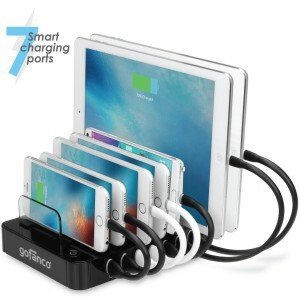 The Satechi 7-port charging station dock is a well-made device with seven different ports that can be used to charge various devices. The ports are all separated by little glass panels that makes it look very elegant and minimalist. All the even ports can be used at once without it being an issue with regards to the power. It functions with high efficiency even with maximum consumption. It is extremely safe to use too as it has its own surge protection on each port so high voltage issues are sorted out by themselves. The Velcro straps that help to keep the cables organized are a great plus and keep all the electronic devices in the house de-cluttered. Overall it is a good product but the only shortcoming of this charging station is that it is a little pricey when compared to other brands but it is compatible with different brands like Apple and Samsung etc. 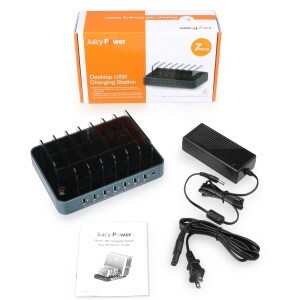 The Juicy power 7 ports desktop USB charging station comes with a stylish and elegant look. This actually looks like something that will definitely save up a lot of room and organize all the devices in one place. The glass panels that have been used to separate the slots are a great plus in terms of the appearance. Even when it is not in use, this charging station looks pretty good. 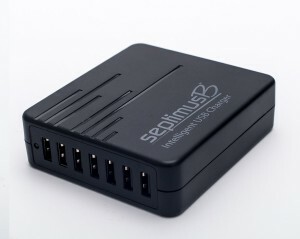 The 7 ports can all be used simultaneously and it has enough power to sustain even heavy usage. According to the manufacturers, this adjusts power among the devices according to the specific needs of each device. So there is optimal output in terms of power consumption which is a great thing. The one shortcoming of this product is that it is priced a little too dearly and it does not come with the cables. So the cables have to be purchased separately which is a little bit of an issue. 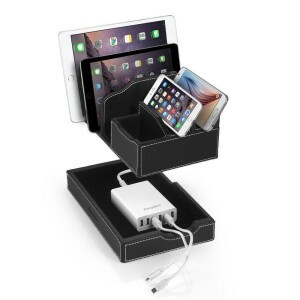 This Gofanco charging station is a great addition to the collection of all the electronic devices in our lives. Except the difference is that this is the one device that will organize all the other ones and save the users from all the clutter. There are seven different ports on this charging station so there is ample room for many phones and tablets and laptops. The best advantage of this product is that it is compatible with almost all the different kinds of devices and brands so you don’t need to go running for different chargers for different products. The glass panel slots are classy to look at and overall the design of this charging station is pretty good. The only disadvantage of this product is that sometimes some of the ports aren’t functional which creates a problem for the user who wants to charge all their devices at once. Other than that it is a great product. 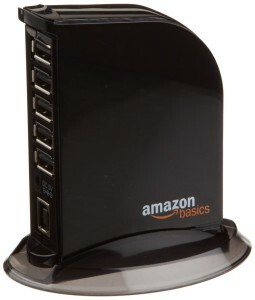 There are 7 ports in the AmazonBasics USB hub that comes with 5V/4A power adapter and it can be used for multi-device charging and according to the manufacturers all of them can be used at once for quick charging. It is a very small and portable product that can be taken along during travel when there is less time and more devices to charge up. 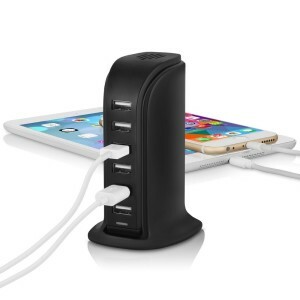 This is a great product for professionals who are traveling on business trips all the time because you don’t need the power to use this USB hub so it is a great companion for them. The price is very reasonable and even though it is not exactly suitable for charging tablets and iPad, the other uses of this product makes it a very necessary purchase. Coming from Amazon itself, the quality of the product is expected to be of high standard and it does live up to the expectations. So this is called the USB charging wall. It has 7 different ports and it claims that the devices will be charged quicker than when using the regular charging equipment. The compact size makes it portable and it can be accompanied with during any kind of travel. 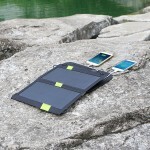 It can actually fit into a pocket so the portability of the device is a great advantage. The 7 ports are compatible with all the brands and the claim of the manufacturer regarding fast charging stands true. It also has a LED light that lets you know whether your device is charging or not. 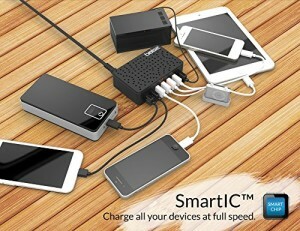 Despite the small size, this USB wall can handle all the 7 ports being used at once with ease. The only disadvantage as far as this product is concerned is that it is only a charging station and not a dock which might lead in a lot of people preferring to buy a different product but power wise it provides maximum output. This mega charging station and the dock is a great addition to a place where there are a lot of electronic devices in use. It has ten ports that can be charged all at once. And despite the high number of ports Unitek has managed to provide ample power to accommodate all the ten charging ports. The design is very elegant and has a minimalist touch to it. The pristine white color only adds to the amazingly uniform design of this charging station. The USB cables are of high quality and stand up to the market standards. 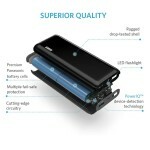 There are minor things that add to the quality of this product like the LED lights that let you know whether you are getting the power, the rubber on the bottom that keeps the unit in its place and the strong build and premium cables that ensure safe and maximum usage of this charging station. Sleek, stylish and portable. Atrico Rapid charging station is one hell of a looker. 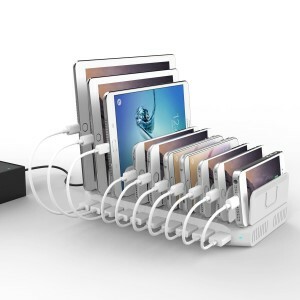 The vertical build of this charging station ensures that all your devices won’t end up in a messy coil. The size of the product is so small that it is ridiculously easy to take it along wherever you go. 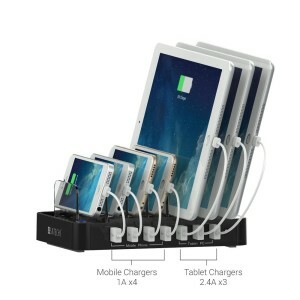 Whether it is a vacation with family and you have several devices to charge or a business trip where you are required to use a lot of devices for work, this charging station will accompany you and does exactly what it says it does. The best part is that it has separate ports for Apple devices which makes it all the more easy to use. But the size also seems to be a reason for the slight under-performance of this charging station. Sometimes it lacks the power required to charge all the six devices at once. The quick charging thing is also not very functional if there is heavy usage of the product. So this is a pretty special charging station. The manufacturers not only promise you a device that works great and has huge power capacity, but they have also taken upon the promise of world peace. Well, there will be less fighting for power sockets now that the world has this charging station is what their logic is. And they are not entirely wrong. This charging station can actually pack a punch when it comes to power. Like they have said there is no compromise in the quality of the product. Even if you charge up to seven devices at once, there is ample power available and the devices actually get charged quicker than usual. The look is sturdy and of good quality. The one thing that can be counted as a con in this product is the fact that the dock is missing which might drive away some people but that is a minor issue because overall this is a very good product. The first thing that you will notice when looking at the EasyAcc single-deck multi-device charging station is its stylish look. The leather like material that it is covered with gives you that feeling of luxury design. It blends into your surroundings whether it is an office room or a corner table in your living room. It will fit in perfectly in any kind of setting. The next thing that comes to mind is the different sizes of the slots in this charging dock. There are so many separate slots, each specifically designed for a particular product, that it just makes the whole process of using it easy and less time consuming. The description says that it is handmade and with an eco-friendly material so that is always a plus. There is one thing that can be improved in this charging dock is the size of the slot. With 6 inch phones available in the market today, some phones may not be able to fit well into their slots so that can be a little troublesome. 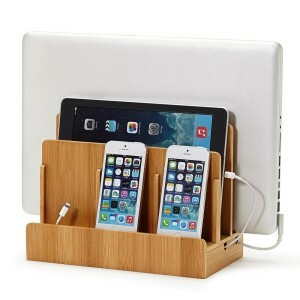 As described in the title, this charging station is made up bamboo which gives a very earthy look to the product plus it is eco-friendly which is always an added benefit. The design is not really your run-of-the mill charging dock kind. The manufacturers have tried and managed to add as much room as possible to their product. The front slot can hold up to three smartphones and there is a separate room for an additional tablet. The best part is that the sturdy build quality of this product makes sure that even a 15-17 inch laptop can also be safely charged using this charging station and dock. The only thing that can be improved further in this already great product is the space allotted to mobile phones in the front which, on occasion, seems to come up short. The front panel could be built a little higher than its current position to make this a near perfect charging station. Note: This is just a DOCK and No USB Multiplier is included in this Dock.